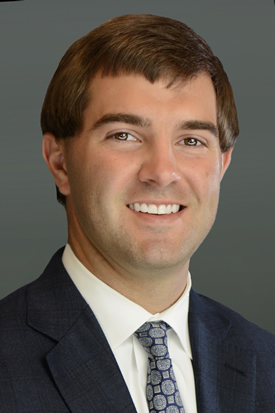 George V. Laughrun III (Trey) is an associate at GCLLG and recently joined the firm in 2015. He works primarily in the area of Criminal Defense. He represents clients on traffic, misdemeanor and felony cases in Cabarrus, Gaston, Mecklenburg, Iredell, Rowan, and Union counties. He received his Bachelor’s degree from the University of South Carolina and his law degree from the Charlotte School of Law. He holds licensures to practice law in the state courts of North Carolina and the Federal Court for the Western District of North Carolina. Prior to joining the firm, George was an intern for two summers at the Charlotte-Mecklenburg Public Defenders Office. He was also an intern at GCLLG in the summer of 2009. George was born and raised in Charlotte and in his free time he enjoys playing basketball in the Mecklenburg County bar league, vacationing at the beaches of South Carolina and spending time with his family.